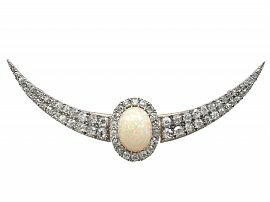 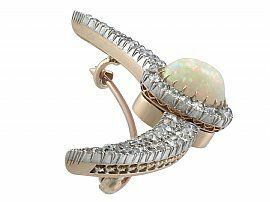 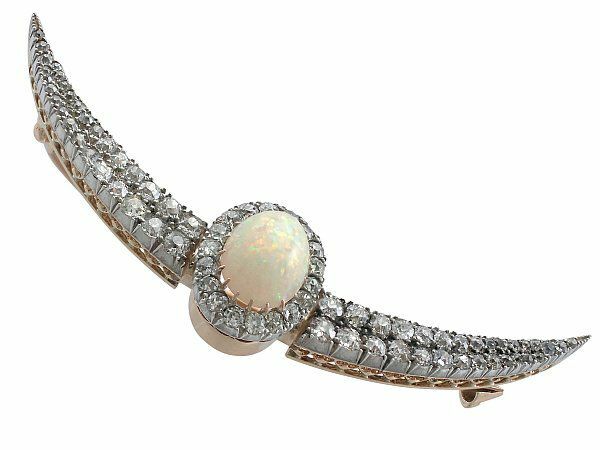 This stunning, large, fine and impressive opal and diamond brooch has been crafted in 9 ct yellow gold with a silver setting. 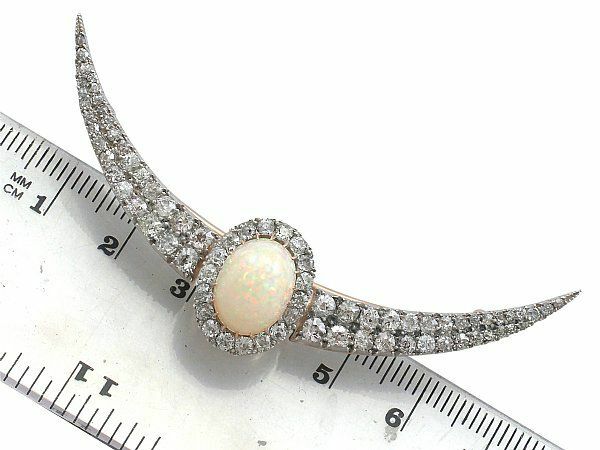 The pierced decorated 9 ct yellow gold crescent shaped frame is ornamented with a feature 4.75 ct cabochon cut opal, claw set to the centre of the design. The opal is surrounded by eighteen Old European cut diamonds, pavé set in silver. 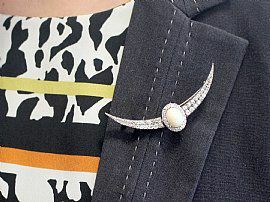 The silver set tapering arms of the crescent shaped setting are embellished with a further fifty-eight pavé set Old European cut diamonds, graduated in size. 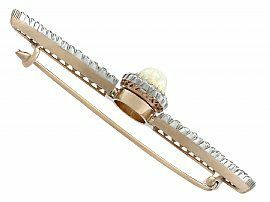 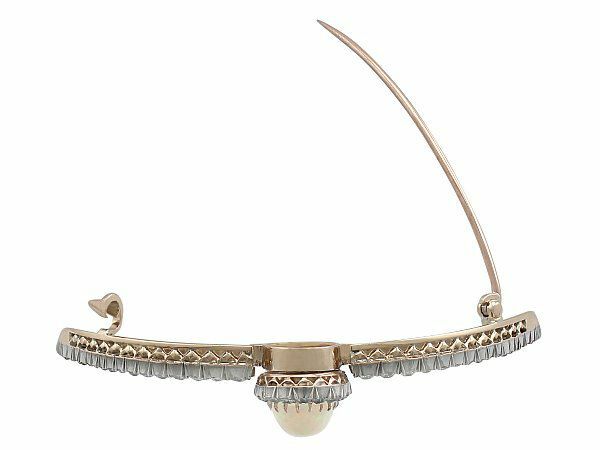 The brooch secures to the reverse with a curved hinged pin and clasp, crafted in 9 ct yellow gold. 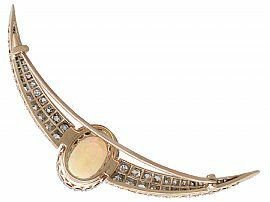 This stunning antique Victorian crescent brooch has been independently tested using state of the art technology (Niton XL2 Analyzer) and verified as 9 ct gold and silver. 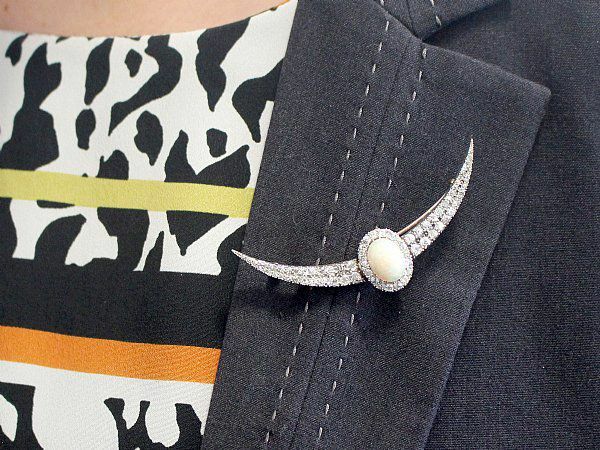 This large antique gemstone brooch is exceptional quality, set with an opal and very well colour matched old cut diamonds, showing fine brilliance. Reflections in photographs may detract from the true representation of this fine example of Victorian opal jewellery/estate jewelry.